Oh my GOD French people forgot for the 6th time their national sport SAVATE and of course all of us that work in their french boxing. Every 4 year 3000 athletes from 56 member countries and 14 observer countries. Enough for savate to go to AGFIS? Yes. But will somebody make this reasonable move? 17th September - 6th October 2009 is 6th edition of Francophone games in Beirut, Lebanon without SAVATE. And always there was English boxing. How typical for Francophone games and French national sport. Important is what they call - (finesse) fineness. Gilles Johannet - leader of French expedition (Ministry man) - Gilles - WILL SAVATE BE PRESENTED in this games? Did somebody from FIS savate contacted you? No? 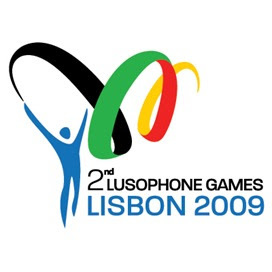 The 2nd Lusophone Games was held on from July 11 to 19, 2009 in Lisbon, Portugal. It is a multi-sport event for delegations representing every Portuguese-speaking national Olympic committees. More than 1300 athletes and officials from 12 countries and regions participated in the Games. Invited by the Organizing Committee, and with the aim to promote wushu sport, the IWUF entrusted the Portugal Wushu Federation, headed by Mr. Paulo Araujo, to give demonstrations during the Games. The Portugal Wushu Federation gave two demonstrations each day on July 18 and 19. The audience warmly applauded the exciting performances and the Portuguese television station broadcasted the show. I HOPE THAT SAVATE WILL BE SOMEDAY PRESENTED ALSO ON SOME FRANCOPHONE GAMES LIKE CHINESE KUNG-FU IS ON LUSOPHONE GAMES. SAVATE on EUSA - european student championship in 2011? The deadline for candidatures for the EUSA Events in 2011 is 15th September 2009. Will SAVATE catch this date? Somebody needs help in FIS office? Championship will take place in Opatija (Croatia) from October 4-10, 2009 and it will be organised by the Polytechnic of Karlovac, Croatia. The Polytechnic of Karlovac is according to the number of students (2100) the smallest member of NUSA. Regardless of that fact they have taken part in the European Championship four times. It happened at the first Championship in Serbia (2001), Slovenia (2003), France (2004), and Croatia (2007). 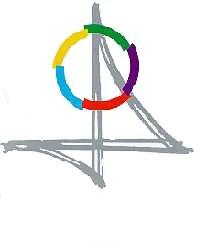 The permanent presence at sport activities has been awarded by the trust of EUSA and NUSA for the organization of the 1st European Universities Bridge Championship which will take place in the city with bridge tradition, also called the Queen of Croatian Tourism, the Old Lady or the Adriatic Pearl. Why Slovenian EUSA student sport authorities lie about UNIVERSITY SPORT? THEY STILL CLAIM THAT UNIVESRITY SPORT IS JUST A JOKE :). WILL FISU TAKE ANY PRECAUTIONS ON THAT KIND OF BEHAVIOUR? CAN WE NAME THOSE PEOPLE AND WRITE THEIR WORDS ON THIS BLOG? OH THAT BANANA COUNTRIES IN THE MIDDLE OF EUROPE AND EU. At the recently held 2009 IAAF World Championships in Berlin, Germany, a number of 2009 Summer Universiade medallists remounted the medal podium for the highest honors in their sport. Especially University of Western Sydney student Dani Samuels who threw a personal best of 65.44 metres in women’s discus to win the IAAF gold. Australian university students also bought home a medal in the track with the men’s 4 x 400 metres relay team securing bronze overnight. Tristan Thomas (University of Canberra) and Sean Wroe (Swinburne University) were joined by team mates John Steffensen and Ben Offereins to take bronze in a time of 3:00.90. 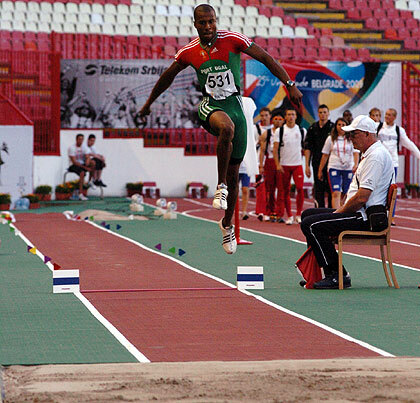 Olympic and Universiade Triple Jump Champion Nelson Evora (POR) jumped silver in Berlin, failing to extend his World title. Ariane Friedrich shows her Universiade Gold in BelgradeIn women’s hammer throwing the full Belgrade medal podium replayed the Universiade competition ending with the same ranking all be it they moved one spot down as Polish Anita Wlodarczyk won the IAAF gold. Betty Heidler (GER), Martina Hrasnová (SVK) and Kathrin Klaas (GER) settled for silver, bronze and 4th place respectively whereas in Belgrade they won gold, silver and bronze. Nevertheless they all improved their throws (Heidler: 75.83/77.12; Hrasnová: 72.85/74.79 & Klaas: 70.97/74.23). Klaas throw her personal best in Berlin, whereas Heidler, who broke the Universiade Record in Belgrade set a new national record with her best throw. Universiade High Jump Champion Ariane Friedrich settled for the bronze in Berlin. These results once again show that the Universiade competitions are of a high caliber. 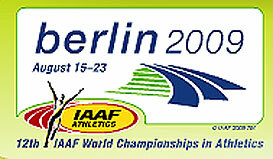 Below a list of 2009 SU participants and medallists performing at the 2009 IAAF Worlds in Berlin. Please note that this list is not complete. You think that POLKA dancers should dance equally TANGO just because this two dances are just dances? Walnier and Scmitt as FIS judges always talked about forbidden techniques - cutting roundhouse low kick executed without ARME phase. But nevertheless all muay thai and kickboxing kicks goes through when REAL savate super-federations are in the game. What would happen if somebody put very strict and new judge in a ring where that kind of technique is performed? 3 mistakes - warnings and you are out' How many shins and forbidden techniques did you see here? Have you ever seen continuation of the fight after performing elbow techniques in english boxing AIBA? Never? Why? Could WAKO kickboxing forget all this money from savate? RECEIPT: Once a year you transform your kickboxing fighters to savate assaut or combat competitors. QUESTION: What do you profit from this transformation? And the money that Ministry of sport gave that kind of "ONCE A YEAR SAVATE FEDERATIONS" is almost 75% of all money that the same Ministry gave to Kickboxing federation for many more competitive activities (which is for naive observer not very fair donation) . Are next steps in Croatia and Serbia? I wonder if Vlade Divac and Josip Cop - presidents of this two Olympic Committees know anything about this game? 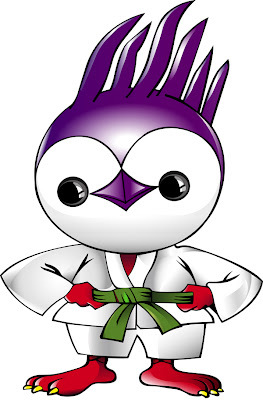 Savate will be AGFIS internationalized in 2010, and many people ask themselves if WAKO will support FIS savate, like it supported it before when it consumed all his competition money? And the next questions - will we see some new faces in savate? And will we still watch on competitions some old faces known for so many years? How much WAKO do you think is in this moment in FIS savate by countries? More than 50 %? Will we fight a battle for savate to preserve it? 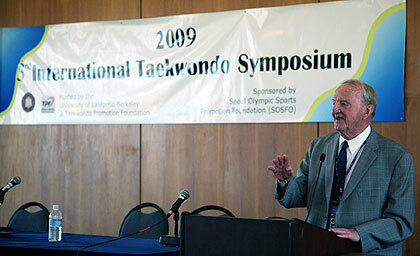 FISU President George E. Killian was a speaker at the 3rd International Taekwondo Symposium which was organised at the University of California in Berkley. Below you will find Mr. Killian's speech. It is a real honor and privilege for me to have been invited to participate in the 3rd International Taekwondo Symposium here in the campus of the University of California, Berkley. The 25th Summer Universiade conducted by FISU and the Organizing Committee of the UB 2009 was held in the City of Belgrade, Serbia where I had the opportunity to meet the President of the World Taekwondo Federation along with you Mr. Ken Min, co-chair of this important symposium and FISU Technical Chair for the sport of Taekwondo and Mr. Russel Ahn, symposium director of this event along with countless other Taekwondo officials from around the globe. It really was old home week for the Taekwondo Family. Let me take just a moment to update you on the results of the Taekwondo competition held in Belgrade in order that you might fully appreciate the role that your sport of Taekwondo is playing within the FISU program. The Universiade drew 380 athletes from over 50 countries for the Taekwondo competition. We would have passed the goal of 400 athletes if we could have overcome numerous visa problems which affected some seven additional countries. The quality of the athletes was at an all time high, which resulted in many outstanding bouts. FISU as most of you are aware is a federation that has made its marks in the international sporting world by organizing and promoting sporting events featuring university students. Like a coin FISU does have two sides, one side devoted to sporting events, and the other side to its educational and cultural events. Today we well focus on the educational side. In Belgrade, I had the opportunity to take part in the 2009 FISU Conference. This conference was organized and conducted through the efforts of the University of Belgrade (Faculty of Physical Education) and the FISU Committee for the Study of University Sport. My remarks at the Conference were entitled “Two sides of FISU coin/ two sides of University Sport”, which leads me to my remarks here today at this Symposium. Today, here at this 3rd International Taekwondo Symposium in Berkley, California, I would like to share with you a very important document entitled “Declaration of Belgrade”. The declaration is the result of much discussion from more than 130 researchers, professors, university presidents, students and university sport officials from 35 countries who took part in the three days conference. I - Conference participants discussed the fact that University Sport has the power to develop social, educational, cultural and ethical responsibility in young people. They strongly advocated an increasing role for University Sport as a key driver, both in offering the student a comprehensive educational experience and in delivering well founded, young citizens for the future. During my presidency I have at all times strived to insure that the benefits of University Sport as outlined in the declaration that I just mentioned are offered by FISU to each of our students. I have constantly in my speeches and remarks emphasized that the future leaders of our cities and countries are the students that have had the opportunity to partake in all parts of our FISU programs, whether athletic or educational. FISU is deeply indebted to all of the participants who took part in this 2009 FISU Conference for the efforts in producing this declaration that will serve as a guide for the future as we continue to explore and promote the value of university sport to all who will listen to our goal. I hope that each of you here today will obtain a copy of the Declaration, study it carefully, and try to incorporate its themes into future University Sport activities. In closing let me thank the sponsors and organizers for allowing me the opportunity of promoting FISU, the one and international sport federation serving the needs of university students throughout the world. And the woman selector of Boxing federation Croatia is the selector of Savate federation Croatia - the same man - prof. Miljenko Rozmaric. (So don't say that savate is inferior to other combat sports). Do you have some data how it looks like cooperation of these sports in other countries? Better cooperation of WAKO kickboxing, AIBA boxing, FIS savate and IFMA Muay thai as it is in Croatia, Europe you don't see in any other country in the world. 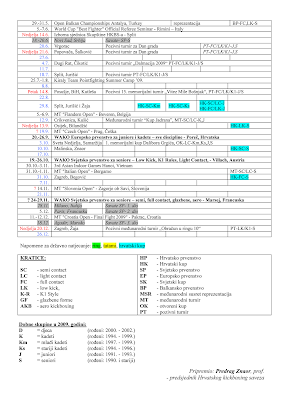 This is calendar of WAKO Croatian kickboxing federation - but it reminds their kickboxing members about savate, muay thai and boxing tournaments also. Calendar is so improved that every fighter can attend all 4 combat sports or so called martial arts. Probably money circulates the same way. But there is only one question - Are there always the same people in all 4 sport fields? Pattaya was also training place for Slovenian IFMA muay thai. Interesting. Day or night - she always win. KARATE didn't make its big success. Welcome back to the family of poor and rejected disciplines. We have to create martial arts and combat (olympic) games. 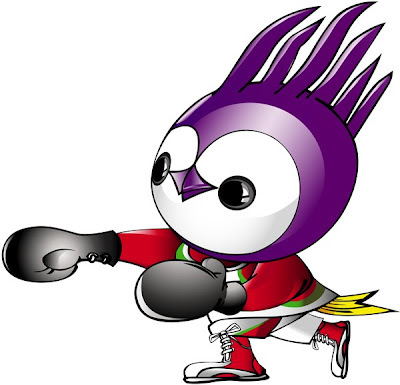 The International Olympic Committee’s Executive Board (EB) has approved the inclusion of women’s boxing for the Games in London in 2012 and will propose the sports of golf and rugby for inclusion in the 2016 Olympic programme. 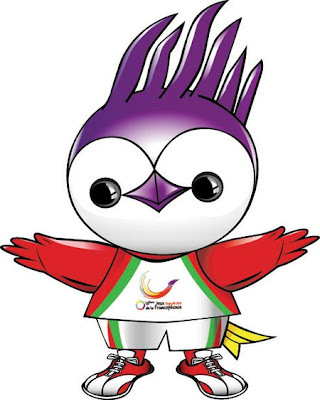 The EB has approved several new events for the 2012 London Olympic Games, all of which had been requested by the relevant International Federations. 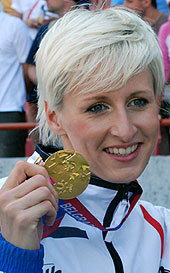 Women’s boxing makes its Olympic debut with three new events agreed for 2012. The 11 current men’s boxing events will be replaced by 10 men’s and three women’s events. Other changes include the replacement of men’s canoeing C2 500m with women’s K1 200m and the replacement of the remaining three men’s 500m sprint events with 200m sprint events. In modern pentathlon a new combined run-shoot format was approved, as was the removal of placement matches in the handball tournament. Furthermore, the EB agreed to consider the inclusion of a mixed doubles event pending guarantees from the International Tennis Federation (ITF) that the top players in the singles rankings would be able to participate. The EB will make a decision on the issue at its December meeting in Lausanne. The EB will propose the sports of golf and rugby to be included in the 2016 Olympic programme for ratification by the full IOC Session in Copenhagen in October. Seven sports — baseball, golf, karate, roller sports, rugby, softball and squash — were seeking to enter the Olympic programme. Assaut in Montreal, Canada. Match: Imme Postma (Belgium) vs Anne Laure Bouvier (Canada) 30th of June 2007. 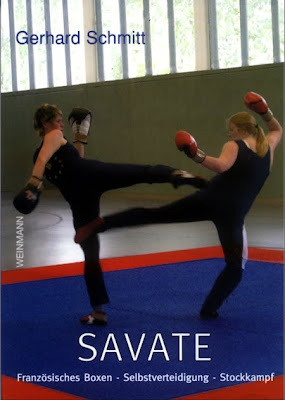 President of the German Savate Federation and well-known International Referee, Gerhard Schmitt has written a new book on Savate and related arts. The book is written in German and illustrated with over 400 photographs. 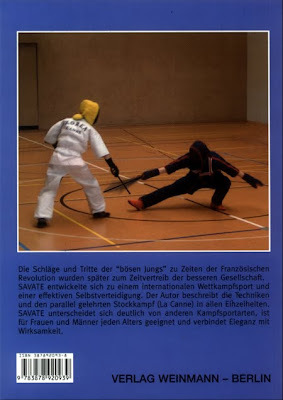 Gerhard describes the techniques of Savate and their uses in assaut and combat. There are some interesting historical photos, as well as chapters on Savate defence, canne, baton and canne defence. Savate combat finals 2006 -> (-63 kg) women. 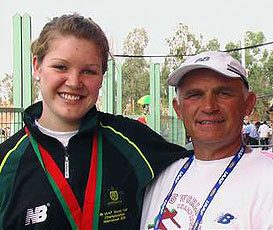 Head instructor - Ola Swensson, Sweden. Teached by Jerome Huon in Levallois savate club, France. And GAT 1 - Silver glove. and in Budo federation of Sweden - why we not find savate as sport that is recognized and GAT 1 proud of teaching it? It is only my opinion ... savate is not kickboxing and GAT 1 is not black belt, and bare foot fighting is not shoe's fighting. Combat games and .... WHERE IS SAVATE????? Why this beautiful science is dying?